The communication intern will be assigned to support the Asia Communication Manager in the implementation and follow-up of our Global communication strategy. Contribute to our newsletter (every 3 months). Knowledge with the Internet (newsletter, blogs, WordPress, etc.) and the main social networks (Facebook, LinkedIn, Twitter, YouTube). 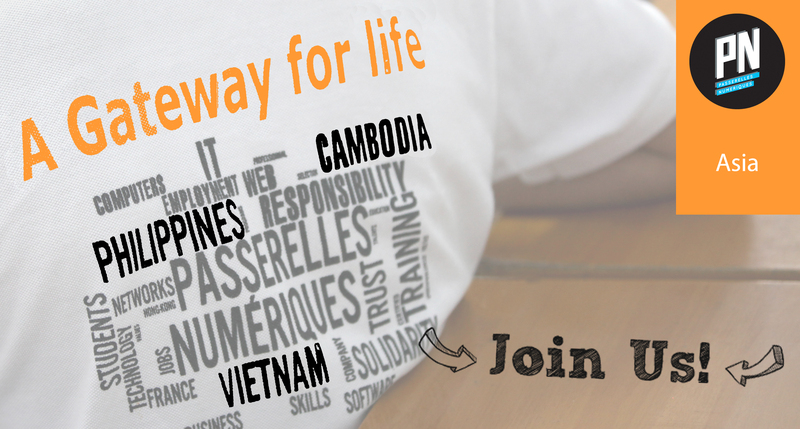 Established in Cambodia, the Philippines and Vietnam, Passerelles numériques currently trains 342 students and employs 101 people based in these three countries including a small team in France.Passerelles numériques relies on the financial and skills sponsorship of several corporate partners such as Accenture, Econocom, CA Technologies, Microsoft and Société Générale and also receives support from individual donors. Passerelles numériques Asia is based in Phnom Penh, Cambodia. This transversal team is composed of 6 staff, who fill the role of support functions. Their goals are to coordinate the operations in proximity with the field.